Existing clogged gutter,,, with new 5" seamless aluminum rain gutter next to old gutter. Old gutter has been capped. Water, leaves, dirt will never enter the previous gutter. New 5" seamless (one piece full length) has been installed and a screen was put over the new gutter to make the new system maintenance free. Picture of new gutter system from ground. A decorative facia piece is installed with the gutter for an attractive finish to the "system". This home also had new vinyl skirting installe along with a new "california room" addition. This picture shows the Gutter and facia, new california style room addition, and vinyl skirting. 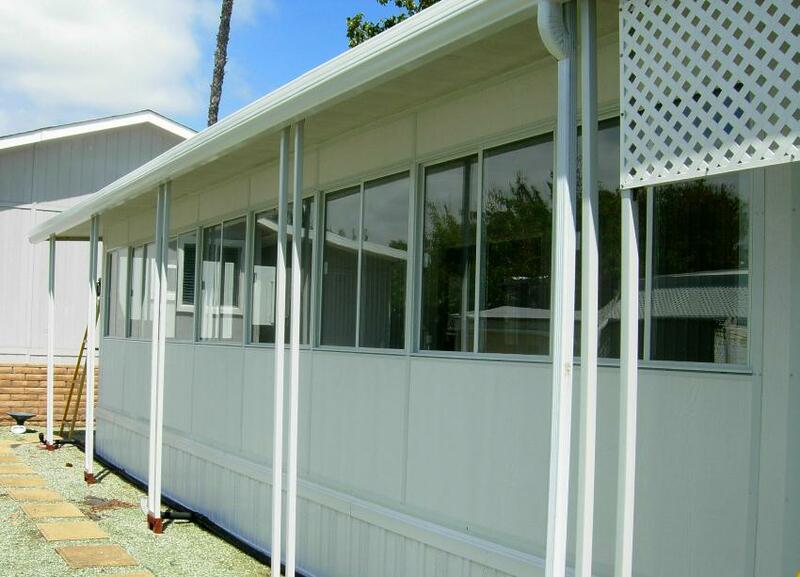 Let Advanced show you too how your existing carport and patio awnings that leak, are nearly impossible to clean, and an eyesore can be modified with our Custom 5" one piece seamless gutter system. This modification is a one time cost and comes with a warranty on both the workmanship and the materials used.